Season and brown ground beef and onions. Drain off grease. 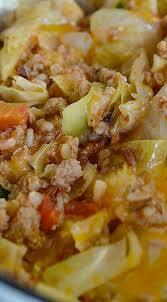 Once onions are clear, add rice, cabbage, tomato sauce, 2 cups of water (or use tomato sauce cans) and diced tomatoes. Stir. Let it come to a boil and then reduce heat to medium low and cover to simmer for about 20 to 30 minutes or until rice is done and cabbage is soft. Do not lift lid before 20 minutes to make sure rice cooks well. Once cooked, top with cheese and cover with lid to melt a few minutes.